But on a certain moment you have to do it all by yourself. And the advice, and practice does not seem of any use on the moment you are grubbing in a box with 40000 bees. The most common mistake is to do hive inspection for the sake of doing hive inspections. It is not recommended to do a hive inspection every few days. And you should keep in mind, the bees know best what needs to happen. I made a lot of mistakes in the first few years when I was beekeeping. By a lot of reading and asking advice to more experienced beekeepers, I managed to develop a method that worked for me. The inspections described are based on the “Aalstermethode” and should be read in conjunction with it. For a successful inspection it is necessary to plan in advance. Every bee hive inspection should have meaning and a goal. It can be disadvantageous if you just do your inspection and start without a plan. It is recommended to develop your own habit and ritual. If you prepare in advance, the joy experienced during the inspection is much greater. During your first inspection a lot can happen. Your first inspections will not be perfect, but this is okay. If you hear somebody bragging about everything going great during their first year, they are probably lying. If you open up a hive there are a few things you can look at. I listed a few below. Just look at how the hive behaves, you can notice a healthy hive on the amount of movement the bees have. Healthy bees behave active and have no sign of diseases. The bees are foraging and are coming home with pollen and nectar. If you see a busy and healthy hive this can give much joy. If you see something odd in the behaviour of the hive, it is worth checking for mites and other diseases. Varroa mite treatment should be done regularly to avoid future problems. Mites are big carriers of viruses which can play part in Colony Collapse Disorder. If the bees behave differently you should check for symptoms of diseases and if necessary ask for help. Early in the season when you see the bees occupy 6 frames, and the hive is standing on one brood box. It is time to give a second brood box or honey super. The bees need the space to expand their brood nest and store any additional food. When the first honey flow starts, bees need space to store the nectar. Honey flow is important for the bees and when there is much available, the bees will prioritize foraging above nursing young worker bees. The worker bees will start to put the nectar in the empty cells. If you notice bees store nectar and pollen between the brood nest it is important to give the bees more space. it is important to add supers on top of the hive. By giving space, the urgency to swarm will be delayed. This is one of the most important thing to check. It is not necessary to see the queen during your inspection. But you should check for eggs in the cells, if there are eggs available you can be sure the queen has been there for the last three days. If you notice multiple eggs in one cell, it is possible egg laying worker bees are present in the hive, but this happens seldom. If you can not find any eggs in the cells, you can check for larvae. If hose are not available,you have a change the hive is queenless. If this occurs during a hive inspection, I go through the entire hive and check for any open or closed queen cells. If a queen cell is open it is possible the queen is already born and the best thing to do is wait till the next hive inspection. When a hive is queenless the worker bees will breed a new queen themselves. In this case you don’t have to do anything. If the bees do not have the opportunity to breed a new queen, due to the absence of eggs. The behaviour of the hive will change, they become more aggressive and will give off a grumpy buzzing. I like to work rather quickly during the inspection, my sole purpose is to try to avoid disturbance as much as possible. I will just check the bare necessities, I go straight past the honey super to the brood nest. If I notice the bees look healthy and are busy foraging, I’m already a happy beekeeper. If I see eggs in the first few frames and no swarming signs I close up the hive and wish the ladies good luck. Every other week, I will go through the whole hive and do a thorough inspection. I am a strong believer that the bees can do everything by themselves. I only facilitate where necessary, because i prefer short inspections. It does not mean I neglect swarm control or hive health. I do think my bees will be disorientated if I disturb them too much. Bees have a very complicated communication system with pheromones, this can be disrupted too much with smoke and noises. Different inspection requires different intervals, to map the inspection I will follow a calendar year and we will start with the spring hive inspection often the third week of April. When the year is still fresh, we can take a look at the food supply of the hive. It is still too cold to open the hive, but spring is still several months away. So we must be sure the bees will have enough food and will not starve, just before the finish line. We can check the food amount by opening the drawer from the bottom. Most bottom boards will have a special drawer, this is too clean the bottom of the hive. On this drawer you can find a pattern of wax mullet on the drawer board. At the start of the winter the bees will form a cluster around the food source. The cluster is formed in the front of the hive, during the winter the bees will slowly move to the back. Wax mullet is eaten away from the comb when the food supply is addressed. The bees will follow the food, this also can be seen on the drawer board. Rows of wax mullet will be formed, when the wax mullet reaches the back of the hive this can also be a sign for future food problem. In case of a shortage of food, we do not feed the bees sugar extract. instead I give the bees bee fondant, which we can buy in the store or make it ourselves (recipe for DIY Fondant below**). The bought or made fondant can be laid on top of the frames. Worker bees will start to eat fondant and process it to the comb cells. The bees will use the condensation on the side walls to dilute the sugar. This is convenient for the bees, it prevents the bees from searching for water outside of the hive. After checking the food supply, try to clean the bottom board as much as possible. During the winter, debris falls down and will be a new home for microbiotic life forms. Bacteria and viruses are nested in here and infection to the bees should be avoided. A few months after checking the food supply and when the first flowers begin to blossom in the fresh new spring. We as beekeepers are full of joy to greet our ladies again. The first cleansing flight are already done and the bees are already busy at work to prepare themselves for a new fruitful year. The timing of the first hive inspection is very important, you should keep in mind it is still early in the season and temperatures are still low. The bees are already building their brood nest, so in the hive the temperature is already 35 degrees C. Often in the netherlands, the first inspection is done in late april. Temperatures are around 16 or 17 degrees C, this means we have a temperature difference of roughly 20 degrees. It is important to do a lean and short hive inspection. During the spring inspection you want to check what the condition is of the hive. How many frames of bees do my hive has? Do I need to combine hives? Is my queen laying eggs? Is there enough food? These are all valid questions and you will notice every hive is in a different condition. There is also not a standard for in which state the bees survive. If the bees made it through the winter, then it is possible to rearrange the frames. Your inspection is in early spring and you have now the opportunity to remove dirty frames. You should replace them with new ones. Every year I try to change out 40 percent of my old frames, brown frames will be replaced with empty frames with wax foundation. the old ones will be melted and processed into blocks for later use (e.g. candles, lotion, lip balm etc.). The spring inspection is essentially the kick off of the beekeeping season. Regular maintenance should be applied with constant intervals. As the first honey flows are on its way the bees are preparing to ramping up their growth towards swarming season. Regular hive maintenance is now very important as the beginning of the year continues. During these inspections you check for brood, egg laying queen or eggs available in the cells, space available to grow and the health of the hive. As the hive expands the first swarming sign will start to pop up. Be aware of them and where necessary take action. Regular maintenance is done throughout the year. Bee inspection in the spring are more frequent before the artificial swarms are made. After splitting the hives, and young queens are born. the intervals change to once every couple of weeks. 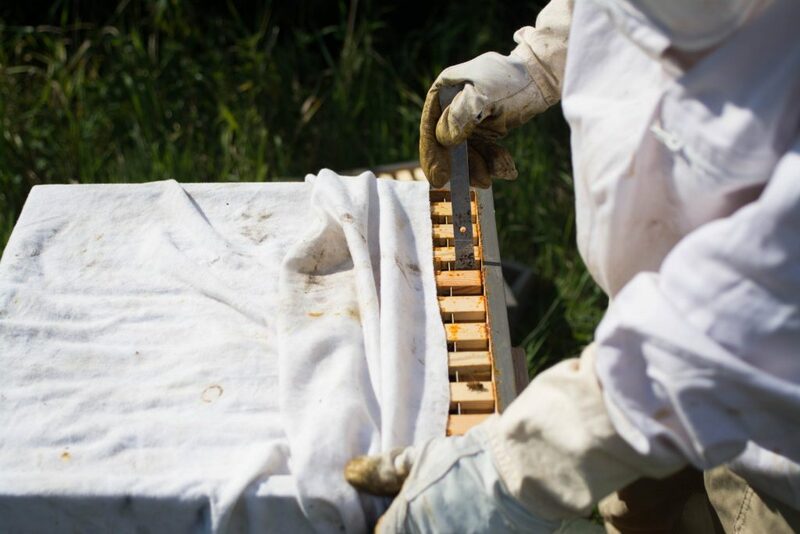 It just seemed like yesterday, when we checked our beehives in early spring. But before you know you’re checking the hive for the last time before winter. Winter preparations are already on its way and the first winter bees are already being born. During the last inspection the primary goal is to check for sufficient food available within the hive. If necessary you can take extra measurements to ensure a good winter preparations. And before you know you close the hive for the winter and you wish the girls good luck. Everytime you open a bee hive there will be a suprise waiting for you. Bees do not work according a beekeepers plan and you should keep it short and simple for yourself. if you are a beginning beekeeper, make some kind of ritual before you start. I do not mean you have to pray to some kind of demi god. But make it a habit to burn your smoker, suit yourself up and organize your tools before you start. If you open the hive work slowly and with patience, bees will react to your energy and always bee calm. Think what you want to do and execute your plan, if it goes not as planned steer where necessary. Beekeeping is not hard, but there are just a lot of variables to play with. Most of all enjoy the moment! * DIY Bee fondant; is easy to make and can be quite cheap, but be aware the honey must be pure honey, preferably from your own hives. For making your own bee fondant your need 1 part honey and 4 or 5 part powdered sugar. Mix the sugar with the honey till a paste like structure forms, how more sugar you add how harder the fondant will get. Note: Honey bought in the store almost always contain american foulbrood. American foulbrood can endanger your whole apiary and in case your bees are infected the local state must be informed. Propolis - Your Sticky Medicinal! Honey Bee Pollen - A (Beneficial) Natural Super Food!